When quickly reading the Ironman press release, the main point you notice that “slot allocations will be equal for both male and female professional athletes”. The “featured image” is a jubilant Michelle Vesterby, further enhancing the perception that this is great for female athletes. However, the sentence I quoted is preceded by the qualifier “base” and followed by “additional slots being distributed to events based on the number of professional starters”. Only when looking closer what this will mean for races and the gender distribution it becomes apparent that the overwhelming majority of these “additional slots” will be allocated to the male Pros, and that the breakdown of the Kona field will be very similar to what it is now (roughly 40 females and 60 males, see my post Estimating the Gender Distribution for Kona). The females will have to constitute about 38% of the total Pro field (the 2017 average was 33.9%) before they have a chance of snagging one of the floating slots. From an equality perspective, probably the only advantage of the slot system is that increased female Pro participation can lead to more female Kona slots, whereas the KPR system fixed the number of slots. However, I don’t like that this pits the female Pros against the male Pros – if the women want more slots, they have to “take” them from the men. This is counter-productive for growing Pro racing and the sport as a whole. Equality is also a glaring contradiction in the new Ironman system: While Kona won’t have equal Pro slots, the 70.3 Championships provides the same 85 slots for both the male and females. Ironman has to be applauded for equal slots at the 70.3 Champs, but their argument of “increasing the female field in Kona would dilute the field too much” is making less and less sense. It’s also hard to see why there are 85 Championship-worthy women on the 70.3 distance, but no more than 40 on the full distance. From the equality viewpoint, the new system is a “meh” – hardly any change. It would be so easy to provide equal slots for male and females in Kona – just provide the same number of floating slots to males and females! They don’t even have to be assigned to the same races, you could showcase the female Pros in a couple of races by assigning two additional slots just to the females (of course offset by races with only additional slots for the men). When looking through the changes the new system would have made to the Kona 2017 field (see my post Determining the Kona 2017 With the New Slot System) one big advantage for athletes is obvious: One great result (resulting in a win in an Ironman) is enough for a Kona slot – the new system’s quick summary could be “win and you’re in”. In the KPR system, most male athletes had to race at least two IMs and most females three IMs or more to score enough points to secure a slot. This aspect is a great benefit especially to the female athletes – the KPR system forced them to race more often than the male Pros as they needed more points to qualify. Of course there is a drawback for the second tier athletes that were consistently racing well but not winning races: It’ll be a lot harder for them to make it to Kona now as qualifying with a third or fourth place needs a big element of luck (athletes finishing in front have to decline their slots). In an indirect way, this also addresses the issue of female Pros returning after their pregnancy to racing: Often they couldn’t race a full season to collect points, for example in 2017 Rachel Joyce or Eva Wutti only started racing in March when more than the half of the season was already gone and most athletes were already way ahead of them. It took Rachel three full IMs to make up this deficit, while even a win and a second place were not enough for Eva. With the new system in place, their first good IM would have been enough to qualify them for Kona: Rachel won IM Boulder and Eva won IM Austria. The new system is also good as a lot of athletes secure their Kona slot early in the season (well before the current first cutoff at the end of July) and are then able to plan their season without having to focus on scoring more points to qualify. This probably won’t matter to the very best athletes – they didn’t have to worry too much about qualifying anyways. But overall a lot more athletes can be rested and in top shape on the Kona start line, probably making the race in Kona even tighter and more exciting than it already is. Overall, the fact that less racing gets you to Kona addresses a big deficiency of the KPR system and gets a “thumbs up”. Under the new system, only the Top 3 finishers in Kona will secure an AQ slot for the following year (validation still required). Under the KPR system, you could pretty much secure your slot after a Top 10 finish in Kona by racing another late season Ironman (some popular choices in November or December were Arizona, Cozumel or Western Australia). On the back of Kona fitness, a Top 6 finish was achievable in the usually relatively small fields. This will no longer be enough to qualify – even after a Kona Top 10 a win will still be needed. Also, 70.3s don’t play any role in Kona qualifying at all (unless you win the 70.3 Champs). This is also a good development, sometimes lots of 70.3 points made it relatively easy to qualify for Kona. Altogether, another positive change. As each of the Pro races creates at least one slot for the male and female racers, the number of athletes in Kona and the 70.3 Champs can’t be any lower than the number of Pro races. Currently, this will make it quite hard to reduce the number of male athletes in Kona – even though a lot of Pros would have preferred smaller fields to allow for a “cleaner” race. Fewer Kona Pros would only be possible with a reduced number of Pro races. So far Ironman has not indicated that they want to shrink the Pro calendar, and there are good arguments for an expansion in the Asian market. Still, the overall reduction in Ironman prize money (6% less in 2017 as compared to 2016) could also indicate fewer races in the future – we’ll probably have to wait for Ironman to indicate what their plans are going to be. Tying the number of races to the number of qualifiers leads to the huge number of 170 Pro athletes for the 70.3 Championships, almost twice the number of Pros in Kona. The actual number of athletes on the start line will likely be lower. For example, this year’s 70.3 Champs in Chattanooga had more about 55 male and female qualifiers who accepted their slots, but only 33 males and 36 females actually racing. 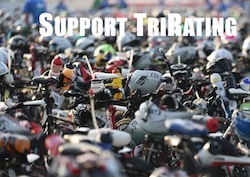 Overall, “one race, one slot” isn’t much of a problem for Kona qualifying but creates a huge field for the 70.3 Champs. Unless a lot of athletes decide not to race, this is likely a “breaking point”, leading either to fewer Pro 70.3s or to 70.3s that offer a Pro category and prize money but no Kona slots. To me, the benefit of the old KPR system was that it provided a lot of analysis opportunity for data geeks like me. So far I haven’t heard anyone who is sorry to see the KPR to disappear. The slot system is definitely an improvement by removing a lot of the criticisms of the KPR, but the way it is proposed for now it still falls short of providing equality in Kona.